There was a time when farfetched comedies filled the boards of the Great White Way. There was something heartwarming about wild plot-driven slapstick that made you laugh and forget about the world. 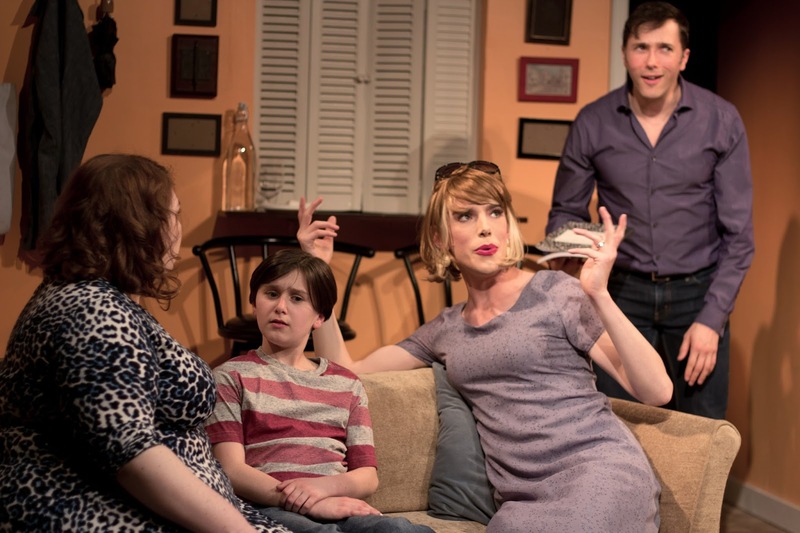 Marshall Goldberg’s Daddy Issues harkens back to that time with a little bit of an edge. Packed with a schticky plot better suited for old-fashioned sitcom, Daddy Issues follows the madcap adventures of a single, aging gay actor who continues to break his family’s heart. To alleviate the heartbreak, a single lie leads to a wild night of confusion and lies. Set in the early 80s in NYC, Daddy Issues follows Donald Moscowitz, a struggling actor, who finds himself single and childless. When his overbearing Jewish parents and fading grandmother hound him on his life, Donald’s only defense is to create a lie and make them believe he does, in fact, have a long lost son with his college sweetheart. To make matters worse, Donald and his bestfriends Levi, a brassy drag queen, and Henrietta, a has been actor turned casting director, decide to hire the neighbor boy to play the fake son. But what happens if a little lie goes a little too far? Written by Marshall Goldberg, Daddy Issues is a cringe worthy comedy with easy jokes and a cheap reveal. Even though it is a period piece, Daddy Issues is insanely dated. With a contrived plot taking over for practicality, Daddy Issues isn’t necessarily a new story but offers a commentary on how a specific generation handled family and homosexuality. Goldberg is able to capture a vital theme deep within his comedy but unfortunately Daddy Issues is so implausible that any substance loses validity. There is an abundance of derisory plot holes that it begins to turn into a ridiculous parade of shenanigans. Because the characters are dimly one-dimensional, crafting a believable arc was near impossible. Sure, they each found change but it didn’t come naturally. What may have been most shocking about Daddy Issues was following the hoax reveal was the next reveal. It was so preposterous that there were audible groans in the audience. Daddy Issues offered a specific style of comedy. It needed to be fast and sharp. For the most part, the company was able to offer it, picking up the cues well. But some of the cast crafted characters that were sadly unfunny. With an absurd amount of fat jokes, there was little Elizabeth Klein could do to make Henrietta a funny character. Klein’s Henrietta was bitter and bland. And she was completely outshined by her counterpart Sam Given as Levi. Given embraced the farcicality of the world and made Levi a big personality that was fun to watch. Though it is baffling that despite knowing he couldn’t stay to play fake mom that he wouldn’t imagine Donald and Henrietta finding a backup solution. But I suppose waltzing in as he did was more for laughs and not dramaturgy. Playing the “straight” man in the show, Yuval David did all he could to keep the plot together. Being the main cog, David kept the machine from going off the rails. Playing beyond his years fake son, Alex Ammerman was an able player. Director-producer David Goldyn succeeded in keeping the energy high and utilizing physical humor. Even in a tight space, the staging managed to mostly work. You can’t blame scenic designer Kevin Klakouski for the bright cantaloupe wall color as it’s scripted but finding a way to make those walls fit properly would have been welcomed. The costumes from Cheryl McCarron didn’t scream 80s, rather fitting the realistic personalities of the characters. With a stage to go bold on, it may have been a missed opportunity. Though grounding the characters did work. In a time of biting, gritty works, sometimes comedy is desired. But styles change and sadly the comedy of Daddy Issues is dated. Daddy Issues is fun for froth and that's about it. But if you're looking for froth with a little bit of substance, you can certainly find it elsewhere.